Eurotrikes' ultimate trike now with even more parent friendly features makes this incredible fully featured trike our top selling model. The brilliant 'grow with me' trike that's perfect for littlies from 12 months old and adapts as your toddler grows. The Ultima Plus Autosteer Trike is a runaway best seller in the Eurotrike range and has raised the bar even further as the new benchmark for parent control, "Grow With Me" trikes. Simply utilise the different deluxe features of the trike to suit your developing child's age and gross motor skills. Ultima Plus incorporates many parent friendly features to make your child's first riding experiences safe and fun and with unsurpassed quality your Ultima Plus trike will last and last ready to be handed on to the next budding biker in the family. Bright colourways to suit both boys and girls. Peace of mind – Eurotrike carries all parts in stock for Eurotrike Ultima Canopy Trikes and replacement parts are easily available direct from Eurotrike if needed. High quality manufacture, components and design. 100% Kid powered. No batteries required! Warranty: Lifetime warranty on frame * (see owner's manual for details). Wide, tough EVA rubber tyres for quiet, easy rolling along. Super strong all steel, 'straight thru' frame and fork construction. Rear handbrake contacts both wheels. Use of a hand brake aids children's gross motor skills. Hard wearing, fade and chip resistant coatings for long lasting life of the trike. Dual mode equipped front wheel with pedal lock feature. (Turn the dial on the front wheel to switch modes). Parent mode: Once set, the pedals will not turn whilst the rider has their feet resting on them. Rider Mode: Once set the rider can pedal forward and backward. High back, multi adjustable position bucket seat with push button 3 point safety harness means safety and comfort ensuring youngest riders do not fall from the tricycle. A built in hand hold on the seat backrest makes it easy for mum or dad to carry the trike too. Steering is a breeze with Eurotrikes famous 'Autosteer' System. It allows parents to control the steering functions by simply turning the parent pushbar. Eurotrike's superior system uses internal rods inside the frame rather that thin cables like the others that easily break and are hard to replace. The parents pushbar clips off when not in use or parent push is no longer required. A built in steering limiter safely prevents the handlebars from touching the riders body preventing sharp turns to make the trike very stable. Multi adjustable and removable parents push bar with wide ergonomic grip area for easy pushing and control. It has 3 telescopic height adjustments plus turn over the handle for an even greater range of adjustment. 6 positions in total adjust height and gait (walking distance behind the tike) for the optimal, most comfortable position for parents of all heights pushing the trike. Adjustable and removable large sun canopy protects young skin from the sun's rays. Folds down when not required or is completely removable or attachable in 5 seconds. Comes standard with a deluxe front carry bucket to hold all your little one's treasures. New fold up footplates on the retractable deluxe footrest folds up and out of the way or down for different age riders. Down for infants. Up for older riders who can reach the pedals. Comfortable safety hand grips with oversize ends position the riders hand safely to prevent hand injury if riding close to obstacles such as walls. 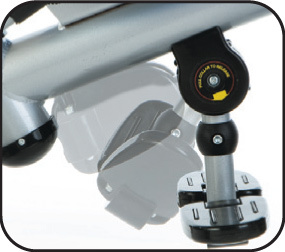 Large 'surefoot' platform pedals with a 'safety lip' positions riders feet correctly on the pedals foe easy learning to ride. Large rear bucket easily holds favourite toys and is perfect for holding mums bag on walks or at the shops.